One feature that is cool, is the simulated 4 head analog tape machine WITH 4 individual outputs for each head. That means you can run loops to different amps (ie: clean loop to clean amp, dirty loop to distorted amp, etc). Now, on to the deal. The Akai E2 Headrush Delay lists at $399, and is usually available in the $150 range, but is currently on sale via Amazon.com for only $89.99 and includes FREE shipping. At the time of this posting, there were 18 units in stock. As the unit counts drop, the price could increase, so if you’re interested, don’t hesitate on this deal! If you own the Akai E2 Headrush, please let us know what you think of this delay/looper by commenting below! 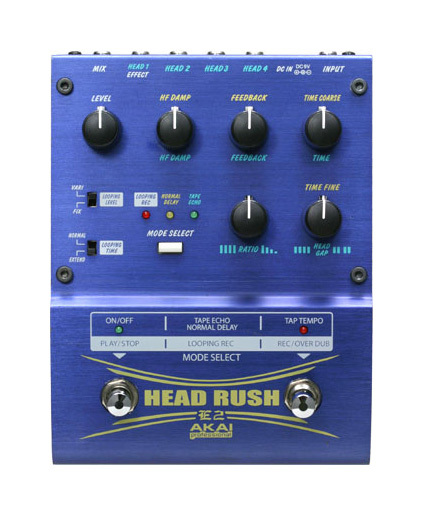 Excellent deal on the Akai E2 Headrush Delay at Amazon Great Deal on the Akai Analog Delay Excellent Deal on the E2 Headrush Delay at Amazon Amazing Deal on the Akai E2 Headrush! Even better, seller on eBay for $53.10 w/free ship, their obviously closing them out, prices ranging from $55-65 are norm now.